Gutter Helmet® of Northwest Ohio is part of Seagate Roofing and Foundation Services, a company that has been in business for over 30 years. We acquired the Gutter Helmet® dealership in 2007 and now serve all of Northwest Ohio and Southeastern Michigan. 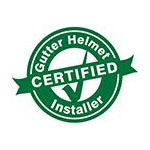 As a locally owned and operated company, Gutter Helmet® of Northwest Ohio works hard to make sure each project is finished to 100% customer satisfaction. We take pride in the high level of professionalism and customer care we’ve offered our clients in our long run in the industry. Our goal: to be the company local property owners want to do business with. Our Gutter Helmet® gutter protection systems were developed after years of research and experience in the home improvement industry and are compatible with all roofing manufacturers. The brand has had a long history of excellence to match Seagate’s and is now the bestselling and most technologically advanced gutter protection system on the market today. In addition to gutter protection systems, we also install five- and six-inch seamless gutters and downspouts made right on the job site. Because Northwest Ohio and Southeast Michigan get very cold during the winter months, we also install optional heat cables within your gutter system to help melt snow and prevent the formation of dangerous ice dams on the edge of your roof. This will keep the water in your gutters flowing smoothly and protect your roof from damage. Besides Gutter Helmet®, the Seagate umbrella of service offerings also covers roofing, foundations, windows, doors, chimneys and insulation. To get a free, no-obligation estimate from one of our Gutter Helmet® sales representatives, call (800) 824-3772 or fill out our online form today.